In his objective study of the texts, Maurice Bucaille clears' away many preconceived ideas about the Old Testament, the Gospels and the Qur'an. He tries, in this collection of Writings, to separate what belongs to Revelation from what is the product of error or human interpretation. His study sheds new light on the Holy Scriptures. At the end of a gripping account, he places the Believer before a point of cardinal importance: the continuity of a Revelation emanating from the same God, with modes of expression that differ in the course of time. It leads us to meditate upon those factors which, in our day, should spiritually unite rather than divide-Jews, Christians and Muslims. As a surgeon, Maurice Bucaille has often been in a situation where he was able to examine not only people's bodies, but their souls. This is how he was struck by the existence of Muslim piety and by aspects of Islam which remain unknown to the vast majority of non-Muslims. 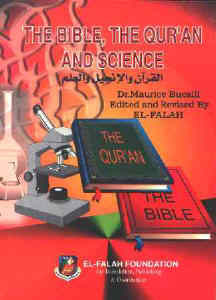 In his search for explanations which are otherwise difficult to obtain, he learnt Arabic and studied the Qur'an. In it, he was surprised to find statements on natural phenomena whose meaning can only be understood through modern scientific knowledge.